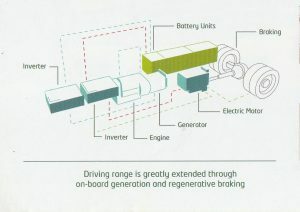 Range is greatly extended through on board generation and regenerative braking. Simple mechanical construction reduces maintenance requirement substantially. Gradeability up to 27%, suitable for the most hilly environment. Achieving the win-win target by enhancing cost effectiveness and environment protection, “the more you drive, the more you save”.